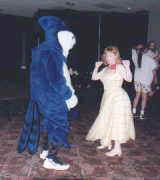 In 1998, the SLCG hosted CostumeCon16. It was a lot of work and a lot of fun. Want to see our Scrapbook? The Friday Night Social was a high school prom, "Stairway to Heaven, Highway to Hell". Here Daren Bost and Nora Mai lend a whole new meaning to "Shake your tail-feathers".